this is the ever-so-magical Quigly. a beautiful bird born of prestige. Quigly enjoys afternoon teas and listening to Bach. he resides on the extended pinkies of sophisticated individuals. if you are one, please give Quigly a home. As I’m trying to decide whether I should come back later to take a photo of this joyful gesture, I see a man walking towards us with a camera hanging from his neck. Filthy, and with an armful of ivy (another invasive species that is handled separately from the holly), I accost this poor man: “Where are you walking?” “I don’t know” he stammers. “Would you take a picture for me and email it to me?” I ask, too directly. 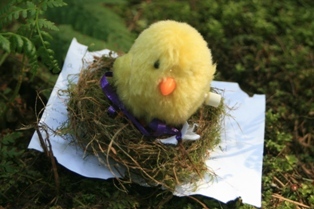 “Sure” he quickly agrees, afraid to say “no.” I rush him down the path, turn into Lily of the Valley trail and point out the little toy birdie in its nest. He takes a picture and shows me the image in the camera’s display. I’m not satisfied. “Can you take a closeup?” “I have to change lenses” he says. And he proceeds to take off his very clean, new-looking backpack, which is specifically made to carry a camera and lenses, and sets it on the dirt trail. He’s got two other lenses in the backpack. He looks at both, chooses one, then proceeds to switch lenses. I make small noises about being sorry for being so much trouble. He takes a few more photographs, makes sure I’m satisfied, before closing up his backpack. .
At this point, I’m anxious to get back to the work shed and the Holly Hauling volunteer leaders, since I don’t know what to do with the armload of ivy I’m still carrying. One thing left – to give this man my email address. He initiates it by taking out his iPhone. First he wants my name. He shows me his screen. First name: I start spelling out y-o-o and he writes w-e-e… “No”, I say, “it’s y-o-o” and he backspaces and writes w-o-o… “No, ‘y’ not ‘w'” He finally gets the first name down. The last name is easy. Then the email address. I start rattling it off, since it is just my name, but he says: “I need my glasses for this.” By now, I’ve assumed that all the other volunteers, including the leaders, have already left. Still, after he’s got my email address saved, I thank him and start to run. Five steps later, I turn and ask: “What is your name?” “Adilson.” (I’m guessing Spanish is his first language.) “Would you like some of my other pictures?” he asks. 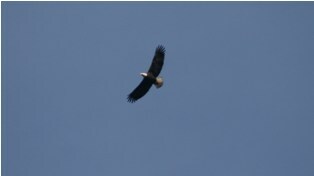 “I had the telephoto lens on to shoot eagles.” “Sure, I’d love them” I respond, and resume my run down the path. I make it to the shed just as the volunteer leaders are about to lock the gate, and am able to dump the ivy. Thank you to the former Quigly owner for the pleasant find. And a huge thank you to Adilson for engaging in the photography project so unequivocally. 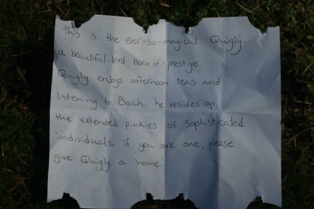 I hope Quigly gets a nice home. he does look magical,doesn’t he.